It's so easy to prepare a Kool-Aid Black Cherry soft drink: just follow the classic instructions! 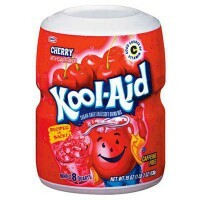 Pour the KoolAid mix out into a pitcher, then add 1 cup of sugar (or adjust to taste). 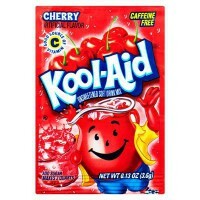 Pour in cold water and ice to make a total of 2 quarts, then stir until the powder and sugar have dissolved. 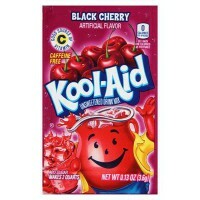 Kool Aid Black Cherry is the most refreshing of them all! 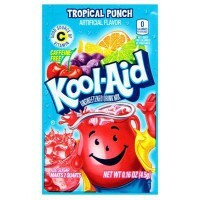 Who doesn't love Kool-aid? Don't wait! Only 7 in stock! 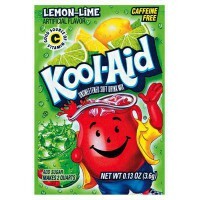 Acidity regulators E330-E341, salt, maltodextrin, color E129*, less than 2% of: antioxidant E300 (vitamin C), artificial flavor, color E133. 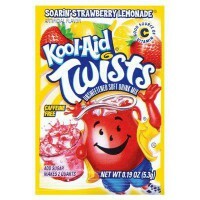 *May have an adverse effect on activity and attention in children. Contains GMO. Nutrition facts (for 100g): calories 0Kcal, total fat 0g (saturated fat 0g), total carbohydrate 0g (sugar 0g), protein 0g, salt 7.5g.